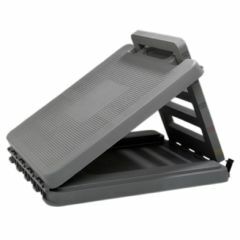 AllegroMedical.com presents The Incline Board - Heavy Duty Plastic - 10 - 30 Degree Elevation - 14 X 14 Inch Surface. Incline boards are used to increase extension in the lower and upper back while stretching the calves. Boards have non-skid top. Slant Board increases extension in the lower and upper back while stretching the calves. Board is made of a heavy-duty composite plastic. Angle of incline adjusts to 4 levels and folds flat (3-inches) to store easily. Levels are 0°, 5°, 15°, 25°, and 35°. The last slot on the board makes an excellent hand-hold for stretching. Non-slip top measures 14" x 14". How much does the incline board weigh?